Organic hand made Gastropub and New American food inspired by street food from around the world. Our Mission is to make great tasting nutritious food made from scratch with local organic ingredients and international flavors from around the world. We are proud to partner the Truth or Consequences Brewing Company to create a unique Gastropub experience for customers. We offer table service to the brewery, and we have a shaded outdoor patio dining area. Our focus on quality food is built on partnerships with local farmers and food suppliers such as La Montanita Coop, South 40 Farm, ZG Farm, Tucumcari Dairy, Fano Bakery, Valencia Mill and other organic/regional suppliers in New Mexico. We are thankful to our local partners like the Truth or Consequences Brewing Company and the general community of T or C for welcoming us. Fresh made organic falafel balls with seasonal organic salad and organic tahini dressing on fresh cooked tortilla wraps. Pulled pork with Korean BBQ sauce topped with spicy kimichi, lime and cilantro on three slider buns from one of New Mexico's best bakeries. Organic hand-cut fries, triple-fried crisp and drizzled with beer-beef gravy over New Mexico cheddar curds. Enjoy our patio dining area or eat your food at T or C Brewing Company next door. Our organic hand-cut fries are brine-fermented then fried crisp, served with Jazzy Sauce on the side. 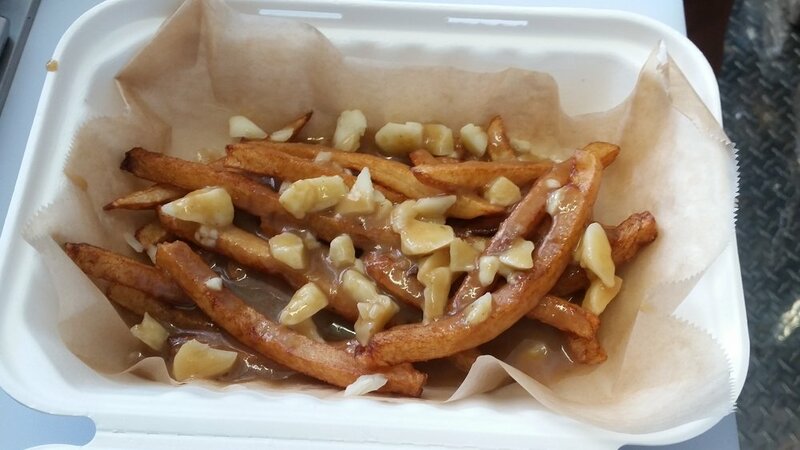 We really do aim to make the best fries you've ever had. Organic corn simmered in fermented butter and spices, topped with lime juice, adobo pepper crema sauce, feta and cilantro. Yummy! Hand-cut organic fries triple-fried crisp, with cheddar curds from New Mexico's Tucumcari Dairy, drizzled in in beer beef gravy made with TorC Brewing Company Porter. Add BBQ pulled pork or BBQ pulled organic chicken for $2 more. An appetizer plate to share featuring seasonally changing flavors such as falafel patties, kalamata olives, organic home-made hummus, organic home-made Ajvar roasted pepper-eggplant spread, baba-ganoush, tomato-cucumber salad and feta cheese from Tucumcari Dairy. A generous portion of BBQ pulled pork and/or organic BBQ pulled chicken, with kimchi, organic sauerkraut, Jazzy sauce and sesame seeds. Half-pound of pulled pork with Korean BBQ sauce made into three mini-sandwich sliders, or a green chile hoagie bun or wrapped in a fresh-cooked wheat tortilla, topped with spicy Korean kimchi, Jazzy sauce and cilantro. Half-pound of organic pulled chicken with Persion BBQ sauce made into three mini-sandwich sliders, or a green chile hoagie bun or wrapped in a fresh-cooked wheat tortilla, topped with spicy Korean kimchi, Jazzy sauce and cilantro..
NM pastured pork green chile pork bratwurst, (mild green chiles) braised in beer then grilled served in a delicious green chile bun, or wrapped in a fresh-cooked wheat tortilla, with organic sauerkraut and dijon mustard. Home made organic falafels with sesame tahini dressing and seasonal organic salad served in two fresh-cooked wheat tortilla wraps. Organic wheat tortillas filled with Persian chicken or Korean pork and Tucumcari cheddar, with a touch of kimchi. Made to order deep fried empanada filled with BBQ chicken, served with Argentinian style chimichurri dipping sauce.